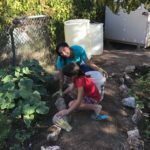 DIAD: In the Garden | Junior League of Tucson, Inc. 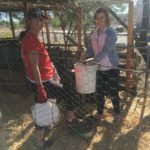 Recently, members of The Junior League of Tucson volunteered in support of the School Garden at Davis Elementary, a bilingual K-5 school in Tucson’s Barrio Anita. 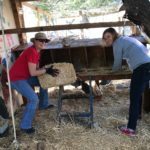 Our members spent our time at this Done in A Day event talking with parents and children, cleaning out chicken coops (!! ), weeding the garden, chopping wood, and picking up litter in the surrounding area. The Garden organizers (Ashley, from the Community Food Bank Farm to Child Program, and Julian, a math teacher at the school) were also cooking during the work day. 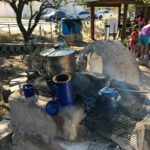 All the time we were there cleaning and working, they had a pot of pozole cooking on the outdoor oven the school had built as part of the garden. We got to enjoy harvesting cilantro and chiltepin from the garden and adding it to our soup! It was really fun to eat together and connect with the kids and parents in this community.